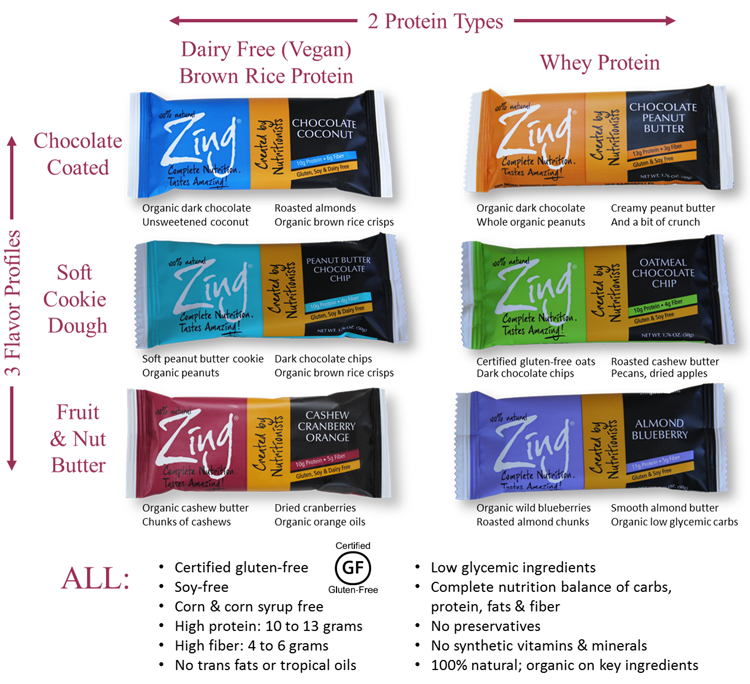 Zing Bars are a protein bar that comes in different flavors with different ingredients. Half of the flavors are made with whey protein and half with brown rice protein. Some are chocolate coated, some are a cookie dough flavor and some are a fruit and nut butter combination. We wanted to keep it simple for our patients to get "complete nutrition," yet we also wanted to satisfy different opinions about what "tastes amazing!" We also wanted vegan options for those who are dairy-free. So we came up with six very distinctive Zing bars that give the most choice in just a few flavors. Half are dairy free (vegan) and half use whey protein (the "gold standard" for muscle building). Two are coated in organic dark chocolate, two are soft chocolate chip cookie dough flavors and two are fruit and nut butter flavors. For all their differences, they all have a virtually identical balance of complete nutrition. A whole lot of choice in just a few bars! All of the bars have 10 to 13 grams of protein, are gluten-free and have 4 to 6 grams of fiber per serving. My favorite bar that I tried was the chocolate peanut butter. This bar was not too sweet and was nice and chewy. One bar contains 200 calories and 15 grams of sugar. My favorite part about these bars is that they are created by nutritionists. They wanted to come up with a snack that was different than your typical peanut butter and celery. They wanted something that was portable and tasty, yet healthy. They made a great point, the recommendations that they make to their clients must taste good too or otherwise, they will not eat it. I enjoyed trying these bars! Another tasty one is the oatmeal chocolate chip. Yum! **Zing is having an end of year blowout sale during the month of December with all flavors 15-25% off - all prices shown on their website are already reduced. I like how there are different bars for different people; gluten free, vegan, organic, plus all the healthy aspects that go into them! I also like the variety of flavors and most of all how Zing Bar created bars for people with different diets all in one line. The amount of protein in each bar is also very decent. Yes, I agree! They are tasty too.